In a bid to put about 20,000 tonnes of house-hold gold to productive use besides cutting imports amounting to $35-$45 billion annually, the Indian government has launched three schemes related to the precious metal, that include domestically minted coins with the images of Ashok Chakra and Mahatma Gandhi. New Delhi : In a bid to put about 20,000 tonnes of house-hold gold to productive use besides cutting imports amounting to $35-$45 billion annually, the Indian government has launched three schemes related to the precious metal, that include domestically minted coins with the images of Ashok Chakra and Mahatma Gandhi. The schemes launched here on Thursday by Prime Minister Narendra Modi include: one to convert jewellery and other similar yellow metal assets with the people into interest-bearing deposits, as also sovereign bonds with eight-year tenure but with an exit option after five years. Speaking about the schemes, Modi said gold has developed a tradition in the daily lives of Indians towards women empowerment. He also said with India-minted coins people will no longer have to depend on foreign sources. Under the deposit scheme, gold will be accepted at notified collection and testing centres. Banks will then issue certificates in equivalence of 995 fineness of gold under short term (1-3 years), medium (5-7 years) and long-term (12-15 years) schemes. "The interest rate in the medium term bonds has been fixed at 2.25 percent and for the long-term bonds is 2.5 percent for the bonds issued in 2015-16," an official statement said. The bonds will be issued by the Reserve Bank on behalf of the central government, and will be denominated in multiples of gram(s) of gold with a basic unit of one gram. The minimum investment limit is two grams, with a maximum of 500 grams per person per fiscal year. The tenure of the bonds -- with an interest rate of 2.75 percent per annum payable semi-annually -- will be eight years with exit option from the fifth year onward. They can also be traded in the bourses, and used as collateral for loans. The gold coins, on the other hand, will be in a physical form and will have the national emblem Ashok Chakra engraved on one side and the image of Mahatma Gandhi on the other. Initially, it will be available at MMTC outlets in denominations of 5 and 10 grams, apart from a 20 gram bar. The launch of gold schemes will deploy India's unutilised gold reserves effectively and help push economic growth while bringing down the current account deficit through lower imports of the metal, industry body Ficci said here on Thursday. "These policies are a step in the right direction and would allow for channelisation of the unutilised domestic gold reserves towards supporting the country's economic growth," Ficci Secretary General A Didar Singh said. "The past few years have witnessed an exponential increase in gold imports exerting tremendous pressure on our current account. 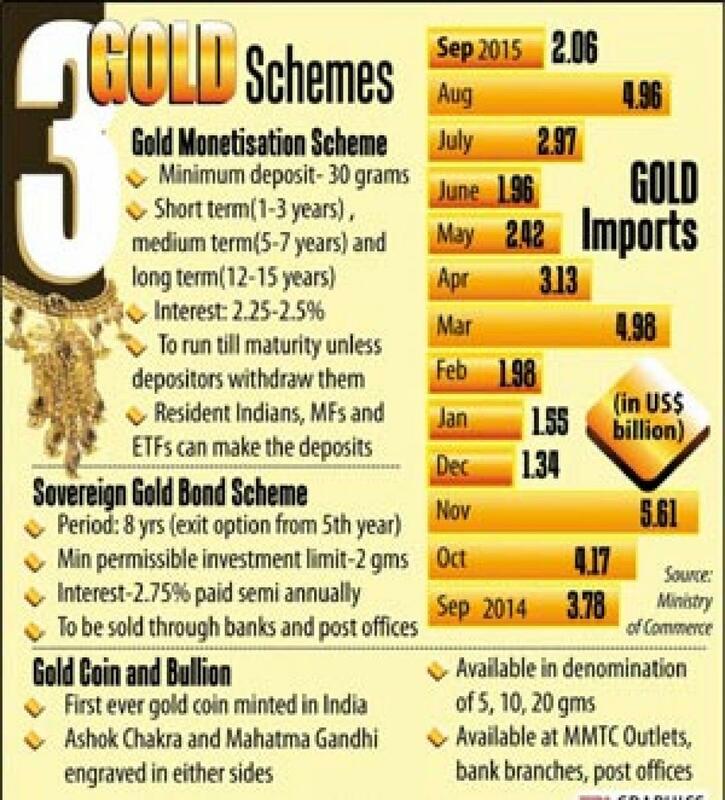 With the schemes being rolled out we should be able to reduce our gold imports," Singh said. Singh pointed out that in order to make the schemes a success, creation of a strong infrastructure and standardisation of price and quality will be essential. "Also, establishment of a Gold Board would allow for better management of gold imports, encourage exports, facilitate infrastructure development and would ensure that India's gold market functions effectively," he said.